A good workplace needs good rules. Otherwise, there would be total anarchy … instead of just the usual partial anarchy. HR folks will attest that a solid employee handbook can help keep employees in line – and employers out of legal trouble. They’ll also tell you that, for the most part, a company’s rules tend to reflect its values and ethics. So, when an employer enforces draconian or even silly rules, what does that say about the business? We scoured the globe looking for unusual rules at real workplaces. Some seem a bit mean-spirited. Others are just plain quirky. But they all have one thing in common: You’re probably glad you don’t have to follow them. Amazon has built some astounding warehouses; both hulking and futuristic. One of the rules it has to keep things working smoothly: Warehouse workers are forbidden to bring any personal items onto the floor that the online retail giant actually sells. Now try that on for size — since Amazon sells nearly everything. The company hawks more than 200 million products broken down into 35 departments. As a result, Amazon sticks to some extreme loss prevention policies. Employees can’t chew gum. They can’t wear lipstick. Workers can drink only water, and it has to be in a clear bottle so the loss prevention cops can look into the container. No soda. No tea. No lemonade. And, of course, take off your watch before starting your shift. And leave your smartphone in the car. Clothing? Well, that’s still permitted – for now! Most people have dealt with a demanding boss. But French Senior Cabinet Minister Ségolène Royal has proven herself to be a real handful. Among other things, Royal demanded employees stand when she passes by. She has an usher that announces her comings and goings so people know to get to their feet in time. The Telegraph reported that when she eats in her private salon, her aides are under strict orders not to use the adjacent corridor as it creates a “noise disturbance”. The rule means that access to the canteen is blocked off for ministerial advisors once Miss Royal has entered the salon. So what are hungry aids to do? Why, let them eat … oh never mind. Perfume bans are no laughing matter for people who suffer from Multiple Chemical Sensitivity (MCS). Those with MCS can have nasty allergic reactions to strong perfumes and colognes. Detroit found out the hard way when it was sued for failing to accommodate an employee’s perfume allergy. The worker won $100,000. Afterwards, the city banned perfumes, colognes and deodorants in three buildings. Since then, other employers have followed suit and laid out fragrance-free policies. The problem is: How do you actually enforce a scent ban? Is there a sniff test? The Society of Human Resource Management says questions about fragrance policies are among the top five inquiries it routinely receives from members. At certain very busy workplaces, like call centers and factories, bathroom breaks have long presented a bit of a challenge. What’s normal and what’s excessive? Employers over the years have cracked down on bathroom breaks with pretty tough, and creative rules. But a Norway call center for insurer DNB set a new standard for one of the more unusual methods of discouraging breaks. The call center tracked how long employees were away from their desks. After eight minutes, a flashing light went off. The company said the system wasn’t meant to punish people for taking breaks. The real purpose, they said, was to make sure the phones were properly staffed and being answered. The DNB case was one in a series of Norwegian Bathroom Wars. Norway’s workplace ombudsman said one firm was reported for making women workers wear a red bracelet when they were menstruating to justify more frequent trips to the toilet. Another company made staff sign a toilet “visitors book.” Still another required employees use an electronic key card to gain access to the toilets so they could monitor breaks. Some grooming and dress code policies are stricter than others. And many times, there’s a good reason behind them, such as safety or health concerns. But some rules appear to be downright arbitrary. For instance, the city of Isesaki, Japan banned all municipal workers from sporting facial hair. No beards, goatees, soul patches or even five o’clock shadows. A few citizens said they found the beards to be unpleasant. So the higher-ups told the public employees to grab their razors each morning. A memo to employees said: “Public servants should look like public servants” and maintain decorum. The Japanese press had some fun with the frivolous beard ban. An editorial in the Japan Times said beards could distract the bureaucrats from important work – like writing up rules on banning beards. The English love their tea. So you can imagine how upset workers at three Leicester hospitals became when drinking tea and coffee at reception areas was suddenly banned. Why such a harsh rule? In an email to staff, a hospital boss said patients were frustrated by long wait times. And they were “inflamed” by seeing employees enjoying a cup of tea at reception desks. Employees were still allowed to drink water. But a hospital spokesman said drinking tea seems more relaxing and gave a bad impression that employees were slacking off. Like most draconian rules, it doesn’t make much sense. Why not address the long wait times – instead placing a blanket ban on hot drinks? 7) The happiest job on Earth? At Walt Disney World everyone from ride operators to janitors are considered “cast members” and so must act in ways meant to maintain the Disney magic for guests. Yet one rule in particular is worth noting. When a visitor asks directions, cast members can’t point with one finger. They’ve been instructed to use two fingers, or their entire hand. Why? Because pointing with one finger is considered rude in some cultures. And international tourists make up more than 20% of annual attendance, according to the Orlando Sentinel. Nick has been writing about management and facilities management for the past three years. He's a Temple University grad with a degree in journalism. Your recent article “7 Workplace Rules That Border On The Ridiculous” although entertaining, rule # 1 Leave Everything At the Door lacks understanding for FDA, USDA, and other manufacturing regulations, especially for those in the food, medical, pharmaceutical, or nutritional industries. These industries have strict guidelines, especially in a production area that include glass breakage protocols (i.e. the reason for no smart phones); jewelry policies (wouldn’t want to find an earring in your favorite food now would you); sanitation and pest control policies (therefore the only water in the warehouses and production areas. Note: distribution centers, such as Amazon must adhere to the same practices as the actual manufacture as they are an extension of the manufactures business. Yes these and many other “rules” that seem ridiculous but employers in these industries must follow and enforce. This is absolutely correct. FDA regulated industries have very strict rules concerning conduct inside the facilities. That being said, I have heard some negative things about Amazon and its employee relations practices. It could be possible that managers are enforcing the rules but will not explain why to the employees. That could certainly make the employees unappreciative of the rules that are in place. 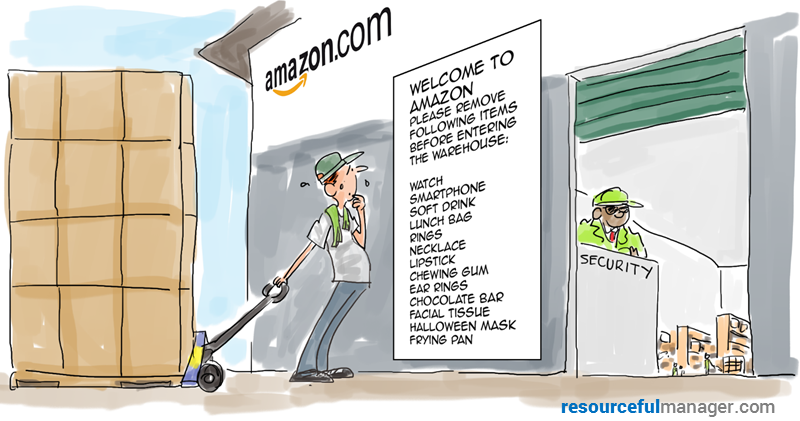 Amazon also forbids employees from speaking to each other on company time, calling it “Time Theft”. #7 – why is pointing with two fingers ridiculous at Disney? Have you noticed on the airplanes that when giving the safety and evacuation directions, the attendant also do NOT point with one finger? As a suffer of chronic allergies and asthma I total understand rule #3. I recently had to request that coworkers in my office area please refrain from room air fresheners and perfumes and lotions. Within 5 minutes of contact with these smells I would first loose my voice, and second have an asthma attack. I suppose in some cases ridiculous rules are in the eyes, or noses, of the beholder. I worked for Walt Disney World. All of their rules were good. When dealing with thousands of people and cultures, they get the A+ for getting it right! Pointing with 2 fingers or your hand only makes sense. With the flashing lights on #4, Some of our departments would resemble discos between rest room breaks and smoke breaks. Far too much time on this particular practice. In future, all staff members will go in alphabetical order. All surnames beginning with “A” will go from 9:45 am to 10:00 am. Those beginning with “B” will go from 10:05 am to 10:20 am, and so on. Anyone unable to attend at the appropriate times will have to wait until the following day for his or her turn to come around. Definitely a good read. Personally, from comparing operational practices between the US and oversea companies we Americans take a lot for granted (employer and employee mind you). Organizational personnel failed to meet mission objectives because they could not see past their own personal preferences. Customers and shareholders want to see positive imagery in a company. If the group is not cohesive…then do what you can to make it stick. Well our “wonderful” company forbids a couple of secretaries from making coffee after they are clocked in for the day. The rest of us can – but two can’t. Smokers are still allowed to have their smoke breaks, however.